This is from personal travel experience so YMMV. But in general, I have never had a connecting flight after 2PM that didn’t get delayed that went through Atlanta. In fact, every single time I had checked in baggage through there when the connection was after 2PM? The baggage didn’t make the flight. There is a good reason for this. 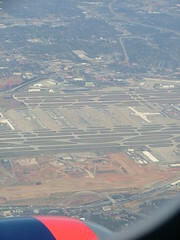 Many airlines that hold East coast operations use Atlanta as one of their Southeast hubs. It also is THE busiest airport in the world due to the many domestic flights that it processes each day. But for a traveler, this also means that you’re going to go through a lot more hassle if you transfer through there. Thus, I usually make sure that if I’m not connecting via an early flight, that I don’t fly through Atlanta. Is it their fault? Probably not. Sure wish PTI had just a fraction of the traffic to keep the rates down. But on the flip side, it is a afternoon/evening connection nightmare.